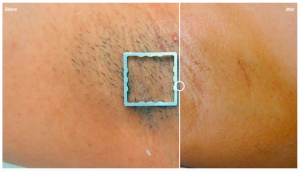 Unwanted hair reduction is mainly considered a cosmetic treatment but mayvery well be the result of medical conditions. Cultural norms and peer group pressureoften require the removal of hair in certain regions. For women hair removal isoften requested in the face, armpits, legs and bikini line whereasfor men hair removal on the chest and back is in higher demand. Controlled pulses of light penetrate the epidermis and are absorbed by melanin in the hair contained in the follicle. Melanin converts the light energy into heat. This heat is transferred to the hair follicle, which is destroyed, making it unable to produce a new hair. The treatment is only effective on growing hairs as these are still attached to the follicle. With Ellipse systems you get the fastest hair removal treatments on the market. The visible light produced by Ellipse systems is carefully controlled to ensure the correct pulse length, wavelengths and right amount of energy to destroy the follicle. Ellipse hair removal treatment offers clinically-proven, safe and effective long-term removal of unwanted hair. Excellent hair clearance is obtained after only 4-6 treatments and clinical long term studies have proven that 77% hair is still away after 10 years.